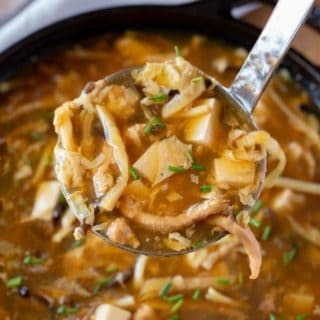 Hot and Sour Soup is the PERFECT combo of spicy and savory, made with pork, mushrooms, bamboo shoots, tofu, and eggs in a savory seasoned broth with soy sauce and vinegar. Add the mushrooms to boiling water and let sit in a small bowl for 30 minutes before slicing very thinly and discarding any pieces that are still very tough. Add the green onions, garlic cloves, onion and peppercorns to a bouquet garni bag or to a large dutch oven or heavy bottomed pot with the chicken stock and bring to a simmer for 20 minutes until reduced by 1/3 (If you didn't use a bag, fish out the ingredients) then keep on low heat while you continue cooking. In a large skillet add the oil on medium-high heat and cook the pork tenderloin then remove from the pan and add in the ginger, bamboo shoots, chile paste, soy sauce, rice vinegar, white pepper and sugar stirring well to combine and bring to a boil before moving the mixture to the dutch oven with the chicken stock. Add the mushrooms to the pot along with the tofu and the cornstarch/water mix and bring the heat back up to medium-low for 10 minutes. Stir the soup in a clock-wise direction at a slow speed and slowly pour in the eggs while whisking slowly to cook the egg while it also spreads out while it cooks (be careful not to let it cook in a giant puddle or in too thin of a stream).